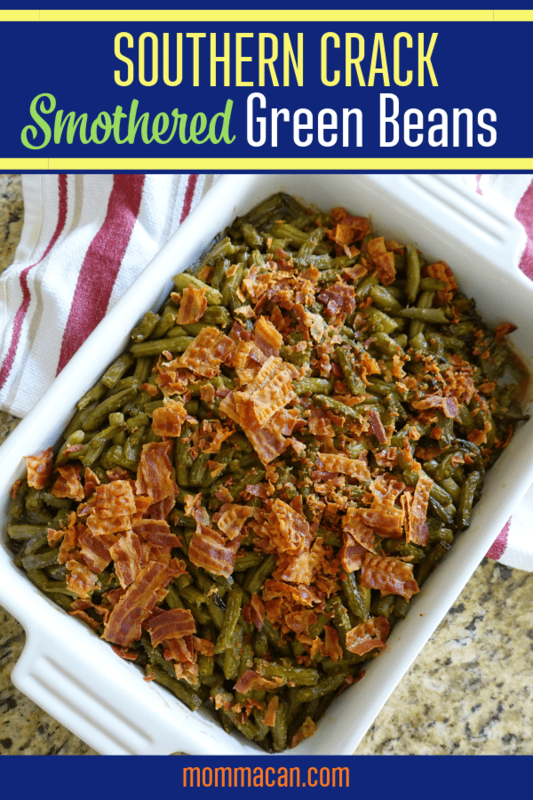 Southern Crack Smothered Green Beans – These Old Fashioned Green Beans with Bacon are delicious. 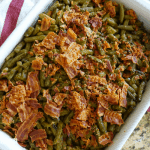 Baked with a sweet sauce and crispy salty bacon and green beans this recipe makes a perfect combination and will feed a crowd! Our Southern Crack Smothered Green Beans will have your kids clamoring at the table to eat their vegetables! 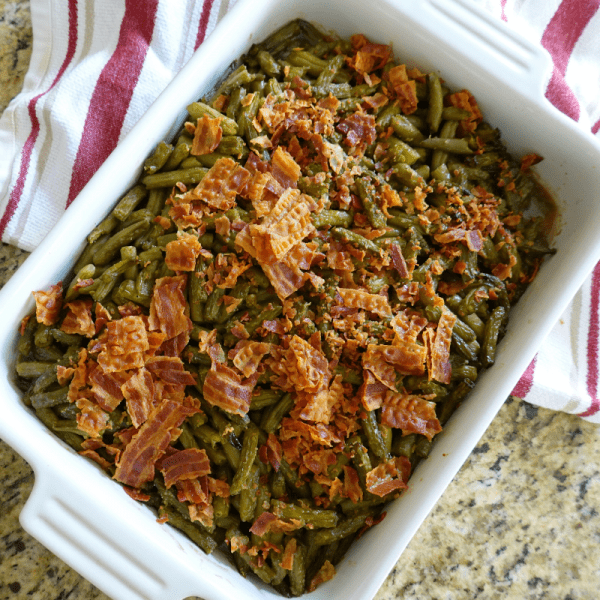 With the sweet-savory flavors of brown sugar and bacon, this combination is worth every minute of waiting in the oven! Why does Southern Crack Smothered Green Beans taste so good? 1. Because it is so easy to make. Wait, is this a reason? 2. Because you use real crisp bacon and lots of it! 3. Everything is better with a little of brown sugar! 4. Tamari Soy Sauce adds a zippy layer of flavor. Delicious sweet and savory Southern crack smothered green beans are a perfect side dish any time! 12 Slices Cooked it a crisp and chopped. Spritz 9 x 13 pan with your favorite cooking spray. 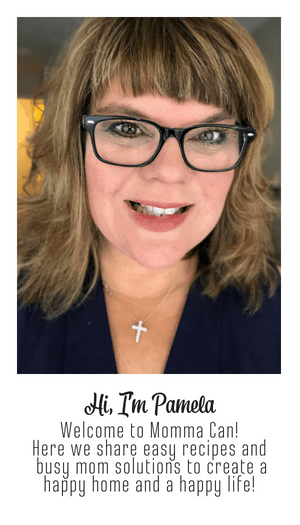 I use plain old Pam for this recipe. Put drained green beans into the pan. Mix the brown sugar, melted butter, tamari soy sauce, garlic powder, and onion powder. Pour over green beans. Bake 40 Minutes in 350º F oven. Substitute turkey bacon or crumbled sausage! This recipe is a family favorite. If you love this recipe serve it up with our amazing mashed potatoes! The creamiest mashed potatoes in the world!